The Graduate, Kramer vs Kramer, Tootsie, Rain Man, Moonlight Mile, Runaway Jury — winners all. Then came the last 10 years. Two painful Fockers movies. I Heart Huckabees (which I did not). Much cartoon voiceover work. I began to despair. But now Dustin Hoffman the director has stepped forward with his first feature, Quartet. You can see by the photo that Hoffman wrangled some major names — Scottish actor/comedian Billy Connolly, and the Dowager Countess herself, Maggie Smith. 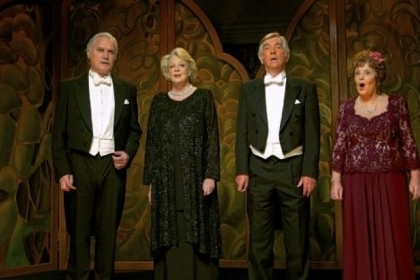 Tom Courtenay and Pauline Collins complete the ‘quartet’ of retired opera singers living at Beecham House, a retirement home in rural England for retired musicians. The movie begins as pretty much everyone at the home is in rehearsals for their annual fundraising concert. Connolly, Courtenay and Collins all want Smith — a recent addition to Beecham — to recreate their famed quartet at the concert. She says no…to pretty much everything. And the movie goes ‘behind the music’ to the pasts and passions of the players. I loved the performances, especially Tom Courtenay as Smith’s jilted former husband. And Hoffman filled the ‘home’ with retired world-class singers and musicians. Just wait till you hear how much music they’ve still got! This entry was posted in Celebrities, Commentary, Entertainment, Humor, Life, Movies, Music and tagged aged to perfection, behind the music, Billy Connolly, celebrities, commentary, concert, Dustin Hoffman, England, entertainment, Humor, I Heart Huckabees, Kramer vs Kramer, life, Maggie Smith, Moonlight Mile movie, movie director, Movies, Music, opera singer, Paulie Collins, Quartet movie, Rain Man movie, retired musicians, retirement home, reviews, Runaway Jury movie, The Graduate, Tom Courtenay, Tootsie movie. Bookmark the permalink.